Carnival depends on the lunar calendar. So it is a movable festival, celebrated seven weeks after the first full moon following the winter solstice. But it also has to fit into a whole cycle with its own significance, the cycle that precedes Lent. Looking at it from that angle, to slot Carnival into the calendar we need to find the first full moon after the spring equinox. The following Sunday is Easter Sunday and the Sunday of the week before is Palm Sunday. Counting 40 days back from then brings us to Ash Wednesday, the first day of Lent and the last day of Carnival. The Thursday before then is the traditional start of Carnival week, Fat Thursday. That means Ash Wednesday moves between 4 February and 10 March, and Fat Thursday between 29 January and 4 March. So we could describe Carnival as a sequence of days that lasts a whole week. Fat Thursday, Dijous Gras, is dominated by food: that is when most of the communal snacks and meals take place. Carnival Friday is the natural day for the arrival of the Carnival King, although that takes place at the weekend in Barcelona. Saturday is parade day in the city, especially in the neighbourhoods. The Carnival King's parade, the taronjada (orange fight) and the big sarau (masked ball) are on Sunday afternoon and evening. Ash Wednesday sees the burial of the sardine and the last berenars populars (communal snacks). The Barcelona Carnival in the 21st century is above all a participatory event. And as Carnival is not possible without some wild merrymaking, a degree of transgression is implicit in it, making it a spontaneous exercise in individual and collective freedom. And it is one of the events in the Barcelona neighbourhood festival calendar that involves the most people. The Carnival festivities have their roots in Roman times, specifically in the Saturnalia, Lupercalia and Matronalia festivals, where the normal social order was turned upside down and social rules were ignored. In the Middle Ages Christianity swapped the worship of the classical gods for a period of masked balls, wild celebrations and disorder prior to Lent. While Holy Week and the days preceding it are a time of abstinence and sacrifice, Carnival means lampooning authority, a break in the monotony of everyday life through excess, revelry and defying restrictions. Masks and disguises are a symbol of camouflage, so people can stop being themselves and let themselves go. Over the course of history, the powers that be have tried to put a stop to this festival, most recently under Franco. The first documented reference we have of Carnival being celebrated in Barcelona is an order issued in 1333 by the then City Council, the Consell de Cent, banning the throwing of oranges and limiting the use of masks to certain occasions. Originally the Carnival celebrations were very long, starting around All Saints, and they were characterised by debauchery and wild, reckless behaviour. In an effort to assimilate this uncontrolled popular festival, the public authorities started to assume responsibility for organising it in the 16th century. Slowly it evolved into the festival we know today, with a series of fixed events such as the Carnival King's arrival, the masked balls and the "burial of the sardine". A taste for disguises and fancy dress, linked to the fashion of the day, gradually developed in the 19th century. That was also a time when satirical literature enjoyed one of its heydays, with satirical bans, proclamations and notices published in the press. There was no official Carnival celebration in the city under the Franco regime and it was not celebrated again until 1980. There are seven ambassadors who accompany the Carnival King in Barcelona because they symbolise the seven historical towns that now form part of the city: Horta, Sant Andreu, Sarrià, Gràcia, Sants, Les Corts and Sant Martí. L’arribo. In Barcelona Dijous Gras is characterised by the arrival of Rei Carnestoltes, who convenes all the public celebrations in the city. 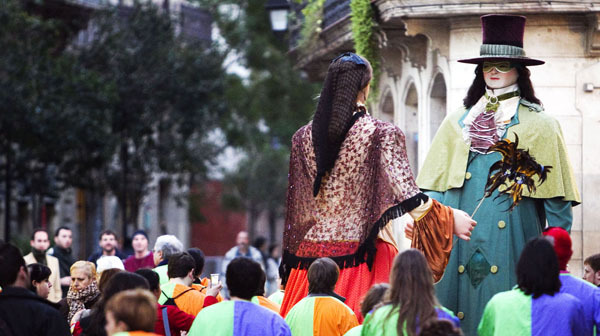 Traditionally the Carnival King arrives at one of the city's iconic spots, Passeig del Born. And when he does, the saraus and the masked balls begin. La rua. Imagination and creativity are the hallmarks of Barcelona's Carnival parades, which are normally held on Saturday afternoon and evening. Thanks to individual initiative, and the vitality of the neighbourhoods and their associations, there are a number of parades. Usually they are led by one of the King's ambassadors, who represent the old towns that are now part of the city. L’enterro. Ash Wednesday, with Lent now in full swing, sees the final Carnival act: the burial of the King. It is also know as the burial of the sardine and a satirical funeral procession is organised at an iconic city spot. This is where the King bids farewell until the following year and marks the end of several days of revelry. Barcelona City Council's Commissioner for Citizen Participation and Associations.